We’d love your help. Let us know what’s wrong with this preview of The Growth of Biological Thought by Ernst W. Mayr. To ask other readers questions about The Growth of Biological Thought, please sign up. This book is a conceptual history of evolutionary biology, divided into three parts, on the history of systematics, the history of evolutionary theory, and the history of genetics. The author was himself one of the founders of the modern "evolutionary synthesis", so his account is very authoritative. He says in the introduction that he may be "accused" of writing a textbook of biology disguised as a history; in fact I did learn a great deal of biology I hadn't known previously from the book. It d This book is a conceptual history of evolutionary biology, divided into three parts, on the history of systematics, the history of evolutionary theory, and the history of genetics. The author was himself one of the founders of the modern "evolutionary synthesis", so his account is very authoritative. He says in the introduction that he may be "accused" of writing a textbook of biology disguised as a history; in fact I did learn a great deal of biology I hadn't known previously from the book. It differs from other accounts of evolution I have read recently in putting the main emphasis on biology rather than geology and paleontology. It also gives a much more sympathetic account of Lamarck than any other account I have read. I can't really say it is a well-written book; part of the great length is due to the fact that it is very repetitious, for example reminding the reader at least once every three or four pages that "essentialism" was bad for biology -- I felt like yelling, "I get it already!" It's also hard to tell who the book was written for; the author will dwell at length on concepts that any reasonably educated person would already know, and then refer without explanation to obscure theories and use terminology that only a specialist would know, especially with reference to contemporary work. Despite these problems, the book is well worth working through for the content and the insights; although it took me almost two weeks to read I was never tempted to give up on it. Just amazing. An unparalleled feat. I can't ever really say I enjoyed a huge science textbook (especially with no pictures! ), but Mayr's book was fairly easy to read and understand and was VERY thorough, even if he is a little defensive about biology the entire time. A historical context is often required for a complete understanding of scientific controversies within a field. 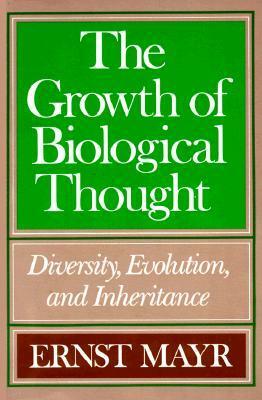 In the discipline of biology, such a book did not exist until Ernst Mayr wrote The Growth of Biological Thought; Diversity, Evolution, and Inheritance. This book attempts to fill this gap in the literature and provide a history of ideas of biology. Prior studies in the history of biology focused on lives on biologists' and discoveries, yet they did not analyze the major concepts, idea A historical context is often required for a complete understanding of scientific controversies within a field. In the discipline of biology, such a book did not exist until Ernst Mayr wrote The Growth of Biological Thought; Diversity, Evolution, and Inheritance. This book attempts to fill this gap in the literature and provide a history of ideas of biology. Prior studies in the history of biology focused on lives on biologists' and discoveries, yet they did not analyze the major concepts, ideas, and problems of biology as a whole. Therefore, Mayr's intent is to fill the lacuna and write a development of the history of ideas in biology, with a focus on diversity, evolution, and inheritance. This paper will first, describe Mayr's book and its major topics, and then, provide my own comments and analysis of the entire book. Mayr structured the book into four topical sections. The first section described various topics including how to write biological history, what biology is and how it fits into general science, and a brief overview segmenting the periods of biology throughout history. This section was helpful in my understanding of the direction of biology from the Greeks in antiquity to the twentieth century. His discussion of various recurring schools of thought, such as essentialism and population thinking, provided a good basis for my understanding of the rest of the book. Though I found this to be one of the more interesting sections of the book, I was surprised and perhaps puzzled over two of his statements. The first was that Mayr wanted to deny the application of Kuhnian revolution to biology. Mayr claimed that incompatible paradigms can coexist in biology for the same period. Another example is the nonconformation of systematics to Kuhn's concept of the progress of science. I do not think that Kuhn believed in a sudden paradigm shift; but as Bernard Cohen said, it is an "accumulation of such contradictory facts that eventually may death knell of a (scientific) theory...and lead to what T.S. Kuhn has called the replacement of one paradigm by another." Therefore, Cohen's description of Kuhn is adaptable to biology. The second statement, which I found to be puzzling, was Mayr's vehement soapbox speech against the physicists and their alleged downgrading of biological science. Mayr returns to this point numerous times throughout the book, and it seemed that he was as biased against mathematics and physical science as he claimed the physical scientists were towards biology. I disagree that "mathematics is to science as grammar is to language." Grammar is a passive structure which does not influence the thought of the writer. Mathematics is an active vehicle of thought that not only conveys and describes phenomena but can be used as a tool of inquiry. The second section focused on the diversity of organic life and described the taxonomic problems of classifying the species. The two main fields of this science are macrotaxonomy, which is the methods by which organisms are classified, and microtaxonomy which is concerned with delimiting and recognizing species. Previous to this reading, I was unaware of the importance of taxonomy and diversity within biology. I took for granted the individuality of all creatures and yet never considered the paradox of classifying and grouping individuals into species. The third section, which received the most attention, dealt with the idea of evolution as it progressed from the ancients to modern thought, with obvious emphasis placed on Charles Darwin. Mayr described all evolutionary theories and I found the various number of ideas associated with evolution in the 50-year time span from Lamarck to Darwin very interesting. Mayr's presentation of Darwinism was the most lucid explanation I have ever read. I particularly liked the breakdown of Darwin's theory into five facts and three inferences for the description of the logic of the theory of natural selection. A comparison of this section to Michael Ruse's The Darwinian Revolution results in the overshadowing of Ruse by Mayr's more thorough, expert, and comprehensive treatment. For example, Ruse's background to evolution began with Lamarck, while Mayr returns to antiquity. Ruse's treatment of the post-Origin of Species period neglected the resistance to natural selection, simply stating that most scientists were converted by 1875, while Mayr lists and describes ten reasons for the resistance of natural selection. The final section of the book discussed variation and inheritance consisting of genetic theories from antiquity to 1980, yet the key period dates from Mendel's genetic work. This was a period which ignored and rediscovered Mendel, saw the emergence and rapid growth of modern genetics, and discovered the structure of the DNA molecule. This was my first in-depth study of this field of biology, other than a cursory examination of Mendel, Morgan, and the double helix structure of DNA. What I considered most surprising in this section (and also in the entire book) was Mayr's claim, "There has hardly been a more decisive breakthrough in the whole history of biology than the discovery of the double helix." This information allows scientists to explain the nature of the linear sequence of genes, describes the mechanism for replication, and explains the nature of mutations in chemical terms just to list a few of the double helix advances. It is my opinion that Mayr wrote an excellent book which accomplished its intent of providing a history of biological ideas. The structure was clear due to his ample use of descriptive chapter and topic titles. I also thought that the title of the book clearly stated that there would be three global ideas that Mayr would trace throughout history--diversity, evolution, and inheritance. My only problem with the content of the book was that Mayr expected the reader to comprehend a broad, detailed range of general biology, particularly in his discussions of the current state of the science. At times I thought that the ideas addressed were not described, so much as they were discussed. Two other problems that I encountered with the book were the glossary and footnotes. At first, I thought the glossary would be a valuable aid in reading the book, but I was mistaken. He claims to present over 20,000 pieces of information throughout his book. Yet, the glossary only provides 81 definitions; and, seemingly, never the ones that I looked up. For example, he includes a definition for soft inheritance, yet he fails to include an entry for hard inheritance. The other problem I had was with his notation scheme which was adapted from the social sciences (name and year). While he does list some page numbers in his reference section, I would have preferred the standard, historical notation system. 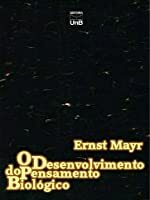 Mayr includes much of his own research into this book because he must believe that it is pertinent to the overall history of ideas in biology. My question is, Is Mayr biased towards the importance of his own work? A glance at the index under the name Mayr reveals 29 references to his own work. The only other individuals with that number of references are Darwin, Lamarck, and Mendel. I also disliked that at times he would refer to himself both in the third person and the first person. This brought an unnecessary confusion to the book. My greatest criticism (and this is merely a personal judgment based on my own sense of values) was that Mayr's treatment of the subject was very depressing from a spiritual point of view. This took me completely by surprise because of my extreme lack of spiritual definition (if I had to chose a label I would call myself agnostic). Nevertheless, I feel that nature, evolution, and philosophy are areas of inspiration. The description of the origin of life does not, and I think should not, read like the recitation of a geometric proof. Mayr took great steps to avoid any form of anthropocentrism, going so far as to say that animals had a certain culture, albeit exponentially less than man's. This seems like Mayr is confused between animal instinct and human culture--two very different aspects of life. Very thorough and interesting, although I did skip a few pages where it told me more than I wanted to know. The English is not too difficult, but could have been plainer. Mayr does go astray a little where he criticises some biologists, especially Richard Dawkins, for the idea that it is the single gene rather than the whole gene pool that is the unit of selection. However, reading "The Selfish Gene", (Immortal Coils chapter) shows that Dawkins is aware that the whole gene pool must be considered Very thorough and interesting, although I did skip a few pages where it told me more than I wanted to know. The English is not too difficult, but could have been plainer. A pleasant little book in case you have a few hours to spare. Ernst Walter Mayr (July 5, 1904 – February 3, 2005) was one of the 20th century's leading evolutionary biologists. He was also a renowned taxonomist, tropical explorer, ornithologist, and historian of science. His work contributed to the conceptual revolution that led to the modern evolutionary synthesis of Mendelian genetics, systematics, and Darwinian evolution, and to the development of the biological species concept. Although Charles Darwin and others posited that multiple species could evolve from a single common ancestor, the mechanism by which this occurred was not understood, creating the species problem. Ernst Mayr approached the problem with a new definition for the concept of species. In his book Systematics and the Origin of Species (1942) he wrote that a species is not just a group of morphologically similar individuals, but a group that can breed only among themselves, excluding all others. When populations within a species become isolated by geography, feeding strategy, mate selection, or other means, they may start to differ from other populations through genetic drift and natural selection, and over time may evolve into new species. The most significant and rapid genetic reorganization occurs in extremely small populations that have been isolated (as on islands).